we have decided to give you an extra gift. These “RescueShops” are so popular they are normally charged at £25, but we are giving away up to 200 absolutely free to our members at Dosthill Quarry and Gildenburgh Water as a way of saying thank you for your ongoing support, and to raise the standards of diver rescue at these two National Dive Sites. Please note these “RescueShops” are practical not classroom-based, so you’ll need your normal diving equipment. Single cylinders, twinsets and rebreathers are all welcome. and come away with dozens of tips to make your rescue technique more efficient. Now you’ve only got 1 weekend left! There’s only 1 Rescueshop left at Gildenburgh Water. Each workshop is from 12noon to 3pm. There is no cost for the workshop, but if you want to dive before the workshop, we’ll open earlier at 7am, so you can get at least 2 dives for the normal dive fee, depending on whether you are a member or casual diver. is the best-value £10 in UK diving! If your buddies would like to do the workshop with you, they must be a member. After they’ve joined, email ian@gildenburgh.com with a list of all the divers. Then get each diver to individually complete the registration form below to secure their place. We will try to get all the divers on the same workshop. Places will be allocated in order of registration, and you must complete the registration form/waiver/medical declaration below to reserve your place. The minimum number for each Workshop is 10. If registrations don’t meet this minimum by 48 hours beforehand, those who have registered will be offered a choice of the remaining dates. before another member gets your place! If you are a member, type your membership number into the form. You’ll find this under the barcode on your membership card. I understand that I dive at my own risk, and participate in this RescueShop at my own risk. I hold a current diving medical OR there are no medical circumstances that prevent me from scuba diving. I am not currently taking any medications that would prevent me from participating in this RescueShop. 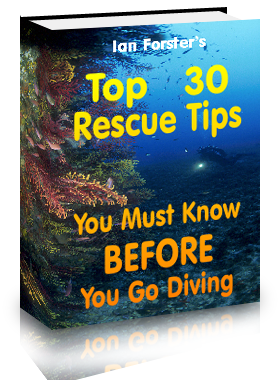 I will read Ian's "Top 30 Rescue Tips" pdf and watch the video before the workshop so I am better prepared. "Your request for one of Ian's FREE RescueShops was sent successfully to ian@gildenburgh.com"
Gildenburgh Water © 2019. All Rights Reserved.